David provided me with some interesting facts about Australian Chardonnay. Historically, Australian wines traditionally consisted of fortified wines such as Port or Sherry. However, there has always been a little of what was called table wine. These table wines were modeled after European wines so they were given names like Claret, Burgundy, Hock and Riesling. The grape varieties were not important and all sorts of grape varieties were blended together. Wines that had less floral flavors were called Chablis or White Burgundy. The Australian wine known today as Chardonnay is a relatively recent arrival. The wine is named after the grape variety and must comprise at least 85% of the named varietal. The first Chardonnay vines arrived in Australia in 1862 through the efforts of James Busby, but the first commercial production of Chardonnay by Tyrrells did not happen until 1971. For a wine that is so fundamental to Australian wine, it is stunning that Australia only started working with it in 1971! Australian Chardonnay started our as a very rich and buttery styled wine with alcohols around 14%-14.5%. The earliest Australian Chardonnays were fermented in stainless steel and then aged in oak. They did not undergo malolactic fermentation. Eventually, the Australians adopted fermentation and aging in French oak and complete malolactic fermentation. The ultimate example of this style was the Rosemount Show Reserve Chardonnay that was oak, buttery and alcoholic. When the first of the hipster generation arrived, they said the Rosemount Show Reserve style was yesterday’s wine and decided to make a “Chablis” style of Chardonnay instead. This style often did not undergo malolactic fermentation and had very little oak flavor. 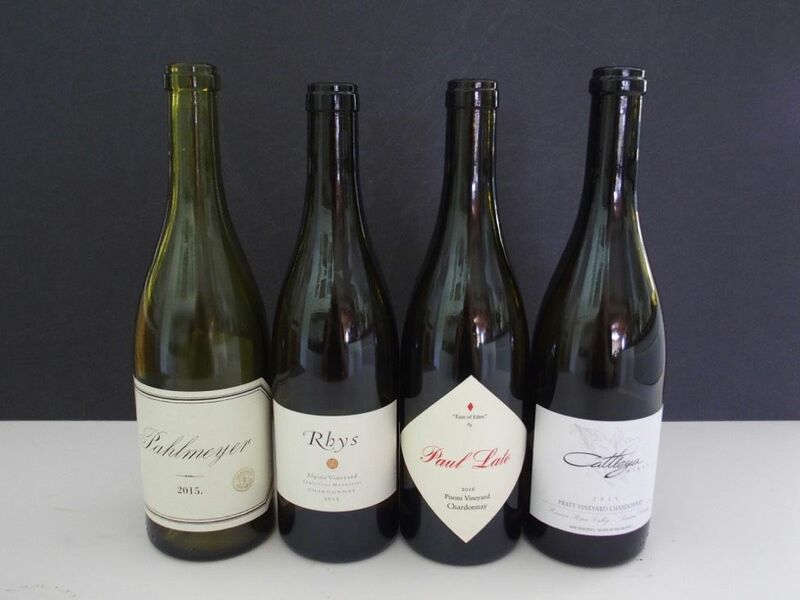 Eventually, change followed, and the Australian Chardonnay market now offers a range of styles. The wines and some impressions. Not a bad wine in the bunch. 2015 Pahlmeyer Napa Valley Chardonnay $80. The most identifiable wine blind. Very oaky, big, ripe and creamy. Still, I would drink this wine and not complain too much. 2015 Cattleya Pratt Vineyard Russian River Valley Chardonnay 14.2% alc., $70. Superb in every way. I scored this wine 94 when reviewed previously. My favorite wine in this tasting along with the Paul Lato bottling. 2015 Rhys Alpine Vineyard Santa Cruz Mountains Chardonnay 13.0% alc., $79. Loaded with citrus fruit and shot through with excellent acidity, even high-strung. Seems less than full malo. 2016 Paul Lato East of Eden Pisoni Vineyard Santa Lucia Highlands Chardonnay 14.5% alc., $80. Fruit veers to the ripe side featuring peach and tropical notes, but flat-out delicious. Seductively creamy in the mouth with enough acidity to avoid heaviness and the right touch of oak. My favorite Chardonnay in this tasting. 2015 LUMOS Wren Vineyard Willamette Valley Chardonnay 12.0% alc., $35. Both slightly under-ripe features of lemon-lime and green apple as well as riper notes of pear and white peach. A bolt of acidity runs through the wine. 2015 Gran Moraine Yamhill-Carlton Willamette Valley Chardonnay 13.0% alc., $45. A leaner, dry, slightly austere style featuring citrus and green apple fruits. Nicely integrated acidity and the slightest oak input. 2015 Haden Fig Juliette Willamette Valley Chardonnay 13.5% alc., $40. Steely with notes of graphite. Citrus and pear flavors that hold on to the finish. 2016 Walter Scott X Novo Eola-Amity Hills Chardonnay $65. Acid and citrus driven, with complimentary notes of spice, toast and brioche. Very stylish, with brightness, vibrancy and edginess. Slightest sulfur on the nose. One of my favorites in this tasting. 2016 Dexter Mornington Peninsula Chardonnay 13.5% alc., $40, screwcap. Aromatically pleasing with scents of citrus, peach, and spice. Slightly viscous ending with a burst of citrus and a touch of matchstick. Many in our tasting group loved this wine. 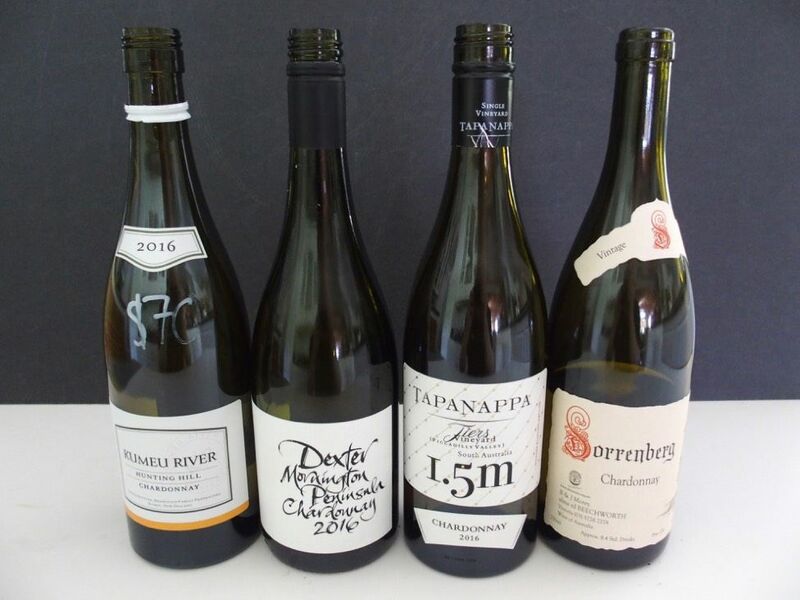 2016 Tapanappa Tiers Vineyard 1.5m Picadilly Valley South 13.9% alc., pH 3.12, $55. 2018 Decanter World Wine Awards Best in Show. Vineyard planted in 1979, the first vineyard planted in the Adelaide Hills. Picadilly Valley is the second coolest and wettest location in South Australia. Dijon clones 76 and 95. Noticeable flinty, sulfur notes on the nose and finish. Stone fruits, grapefruit and brioche, finishing a bit sour on a soprano note. My least favorite wine in the tasting. 2016 Sorrenberg Victoria Chardonnay $55. 30% new French oak. Complete malolactic fermentation. 10 months of lees contact with stirring. I liked this wine a lot with its mineral-imbued, floral and spice nose. There is a charming spice from Sirugue French oak aging. Several tasters liked this wine including me. 2016 Kumeu River Hunting Hill Chardonnay $60. Vineyard first planted in 1982. Often a significant contributor to the Estate Chardonnay. Enchanting wine that us very giving but not heavy. Plenty of citrus, stone fruit and mineral aromas and flavors to please. Beautifully balanced and charming. One of my favorite wines in the tasting. 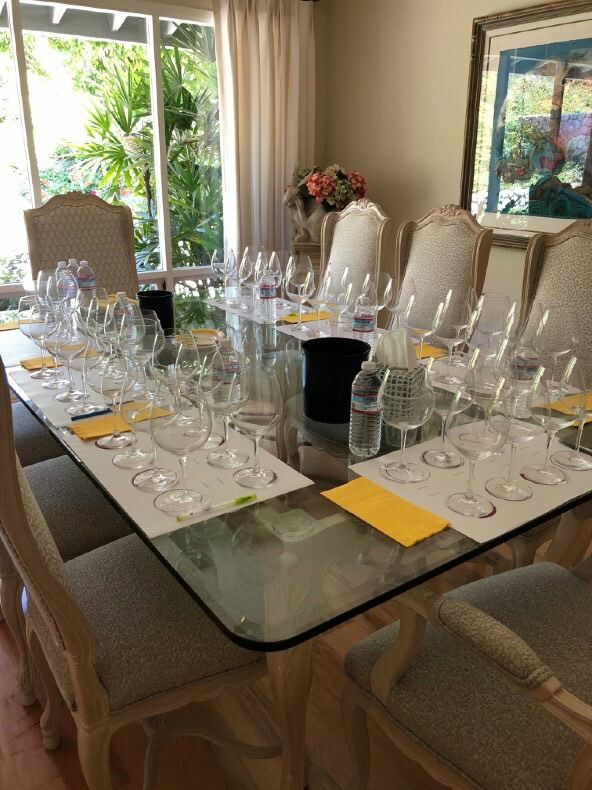 I thought the California, and Australia Chardonnays and one New Zealand Chardonnay were similar in style. 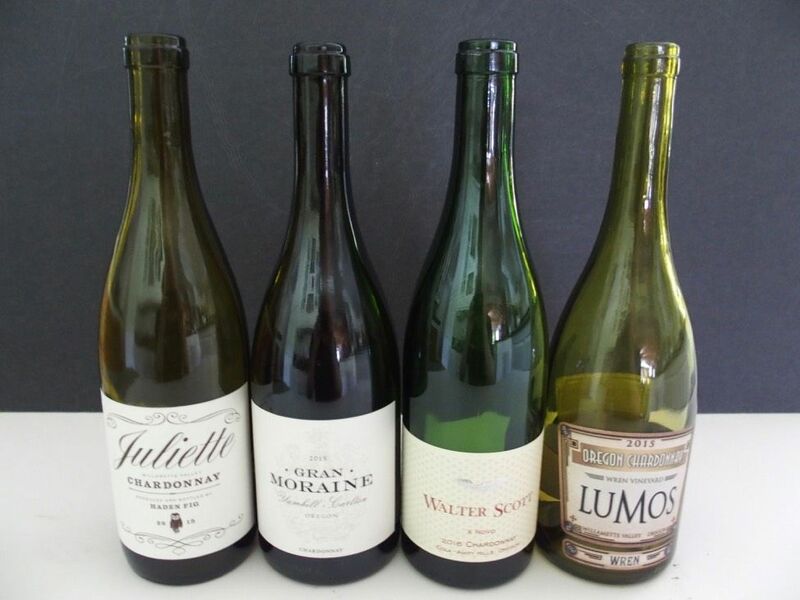 The Oregon Chardonnays tended to be a tad leaner, lower in alcohol, with more acidity ( and less expensive). None of the wines in this tasting had noticeable diacetyl (butter) character. The Australian Chardonnays tend to feature a flint/matchstick character (volatile sulfur compounds) which may or may not be pleasing depending on the intensity. Top end Australian consumers do like the struck match character in Chardonnay if it is not too strong. This matchstick character is similar to that found in some French white burgundies such as Coche-Dury and Pierre-Yves Colin-Morey. The flint character tends to be very subtle and often completely absent in domestic Chardonnays.